It is a powerful tool to convert Video clip to animated GIF file. Not like other GIF converter software, this software is accurate to one frame, not one second. So it is more accurate. Picture cropping, flipping, resizing, scanline and color effects are supported. It may set the GIF replay speed. It also allows you to add watermark to the output GIF file. This software supports various popular video formats, such as avi, mp4, wmv, asf, mpg, dat, 3gp, flv, f4v, mov, mkv, rm, rmvb, swf, vob, webm, etc. The interface is very user-friendly and easy-to-use. It is a powerful media editor to cut/convert video/audio files. It also can convert audio to video (for example, mp3 to flv) or convert video to audio (for example, vob to wma). It allows you to edit media files in various formats like 3GP, AAC, APE, AVI, M4A, MP3, MP4, OGG, F4V, FLV, MOV, MKV, VOB, WMA, WMV, etc. Video cropping, flipping and rotating are supported. The 'Direct stream copy' function is able to cut media file directly without re-encoding . It is a powerful video tool to join/merge multiple video files and combine them into one. You can join as many video files as you wish and easily rearrange their order if needed. If all input video files are same format, you may use the 'Direct stream copy' option to join them into one big file within just seconds. 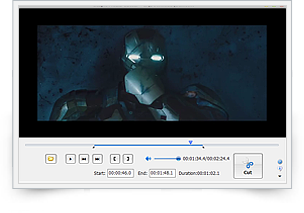 It is a powerful media converting utility that not only supports convert video to video (for example, MP4 to 3GP) and convert audio to audio (for example, APE to MP3), but also supports convert audio to video (for example, mp3 to flv) or convert video to audio (for example, AVI to MP3). This software supports various formats like 3GP, AAC, APE, AVI, M4A, MP3, MP4, OGG, F4V, FLV, MOV, MKV, VOB, WMA, WMV, etc. Video cropping, flipping and rotating are supported. It is a all-in-one audio editor, recorder, converter, splitter, joiner and player. A full set of effects and editing features are included for professional sound production. When editing audio files you can copy, cut, paste and mix any portion of audio files. If required, you may add effects like Amplify, Fade In, Fade Out, Delay, Reverse, Noise Reduction, etc. MP3, WMA, WAV, OGG, VOX, RAW and many more audio formats are all supported for direct audio editing. 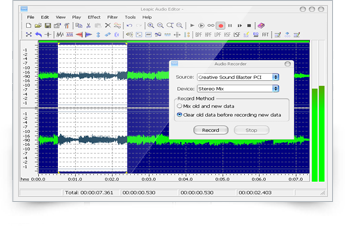 It is a very useful audio file editor. It is able to Not Only cut out pieces of MP3, WMA, OGG or WAV file, But Also convert audio file between WMA, MP3, OGG and WAV formats. It is fast and no sound quality loss. You just need to open the audio file, set the start point and the end point then click the Cut button to save the selection. 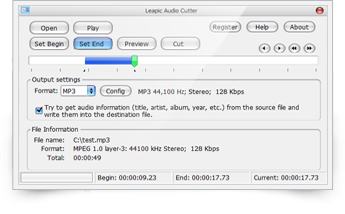 Leapic Audio Cutter allows you to play the selection with build-in audio player before performing cutting. 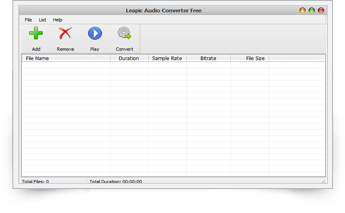 Leapic Audio Converter Free is a quick and easy-to-use audio converting utility. The purpose of this software is to convert audio file between the most popular audio formats, including WMA, MP3, OGG, M4A, M4R, MP2, AAC, AC3, AIFF, FLAC and WAV. The conversion process is very easy to handle with super fast speed. It also allows you to play audio files with build-in audio player before performing converting. It is a nice utility you can use to easily optimize GIF file for your website. Savings of up to 90% in file size is possible, which can decrease web page download times, save the disk space and reduce bandwidth charges. 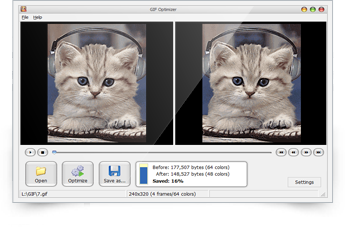 GIF optimizer includes two preview panes to help you compare the original GIF with the optimized GIF. The color reduction option is able to create much smaller GIF! It is a all-in-one CD burning software that helps you to create audio CDs from your favorite MP3, WMA or WAV files. Then you can play them in your regular stereo or car CD player! You may choose to burn 74 or 80-minute audio CDs on either 74-minute or 80-minute CD-R/CD-RW discs. There is no need to convert to WAV and your CD is burned directly. 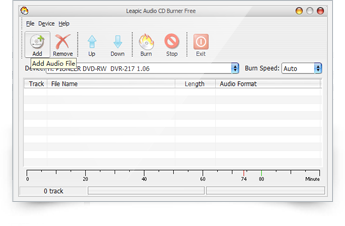 Simply browse and select the audio files or drag and drop the audio files onto the main window, press the 'Burn Now' button, and in a short time you will have a custom Audio CD. Copyright © 2008- Leapic Software. All rights reserved.